Not ironic words, but ferrous words, which takes us into the world of Ferris wheels, Ferris Bueller’s Day Off, Ferris mowers, Ferris State (in Big Rapids MI), Tim Ferris (the self-help writer and entrepreneur), Ferris TX and Ferris IL, Southern folklorist Bill Ferris (former chairman of the NEH), and from there we could branch into ferries and fairies and all sorts of good stuff. Meanwhile, from percolate and percale, we can get all the perks available to those who only stand and iron. 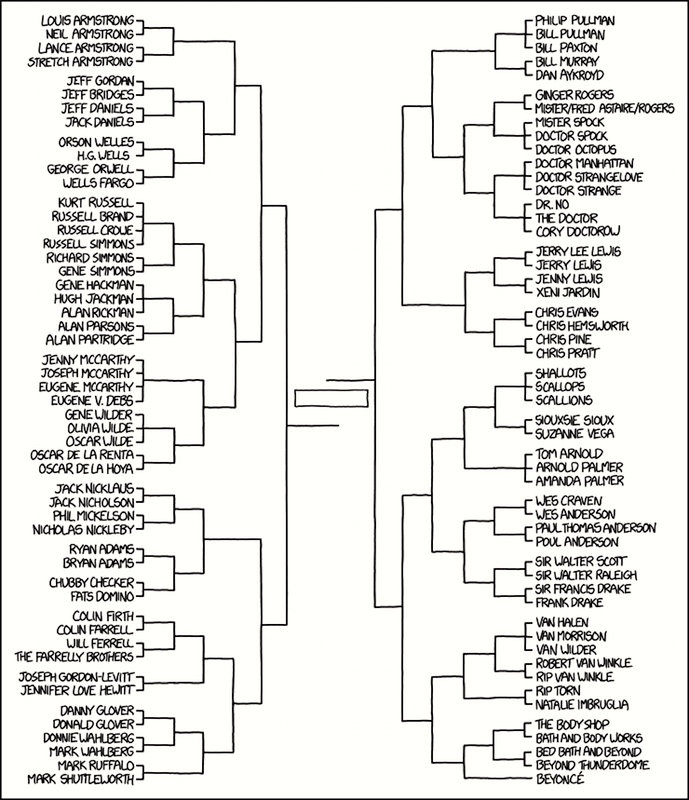 Tremendously funny use of bracket diagrams for sports tournaments to do free association of names: shared first names (golfer Jack Nicklaus, actor Jack Nicholson), shared last names (golfer Arnold Palmer, musician Amanda Palmer), last shared with first (actor Tom Arnold, golfer Arnold Palmer), etc., often with other shared bits of form (like the /nɪk/ of Nicklaus and Nicholson). And more complex associations, like actor Rip Torn and singer-songwriter Natalie Imbruglia (and her song “Torn”). Most of the associations run through long chains: Danny Glover to Donald Glover (last names, plus the D), Donald Glover to Donnie Wahlberg (first names, full and nick-), Donnie Wahlberg to Mark Wahlberg (last names — in fact they are brothers), Mark Wahlberg to Mark Ruffalo to Mark Shuttleworth (first names). You could spend a day enjoying the trip through the diagram.